i think i've mentioned this in my blog a few times now: that i am not a huge fan of day hikes. in the realm of outdoor jaunts, they occupy the lower rungs of priorities, bunched up with rock climbing and surfing, below trail running, beach camping, and landscape photography. the reason is simply that i would like to spend more time on the mountain itself, and more time with people who share my passions. 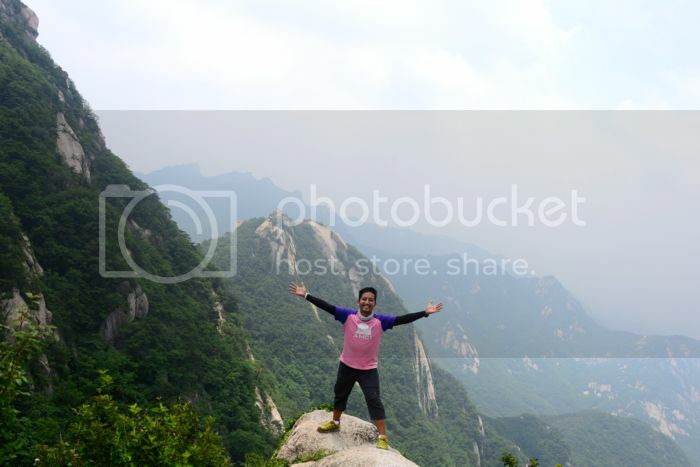 a day hike strips mountain experiences into their barest, assumes that reaching a peak is an end and complete in itself, and that communing with nature can be reduced to a brief look at the surroundings and a quick snap to be paraded on social media. so that is the reason why the 8 day hikes i took since last year number more than all the day hikes i've done in the first 8 years that i've been climbing mountains. my friend jason agrees with me: day hikes are great as part of a training plan in order to prepare for even more challenging excursions outdoors. it really is a form of exercise, where being both fast and light are important. it doesn't sit very well with my personality since i take my time on the slopes, and do not so much mind the weight when it translates to having delicious meals and enjoying certain comforts on the campsite. also, anyone who says that he does day hikes exclusively ignores many other places worth a visit. indeed, the limitations inherent in a day hike have resulted in my very short resume as a peak bagger. my first day hike last year happened when i agreed to take my friends to mt. gulugod baboy in order to prepare them for a trip to nepal which included a hike along the annapurna trail. we were still on the road when one of our companions decided to turn back. perhaps i am cursed by the length of my experience since i often find it surprising that people think these hikes are impossible. i am particularly annoyed by people who complain about a kilometer when i've found myself loving the length of my labors. but that hike also made me realize that construction was afoot on the slopes of gulugod baboy, and that by this time, cars can actually drive all the way to the saddle between its two peaks. the video i made reporting on the development earned more than 2,000 views on youtube in just 3 days, which is a feat where my career as a youtuber is concerned. in may, i accompanied my friends jazzy and clint on their "wedding climb" to mt. talamitam, an activity which exploded on facebook with streams of congratulations and jealous comments about not being invited. what people didn't know was that no real wedding took place (it happened later in november), and it was just a ruse for us to come together, pack long-sleeved shirts, ties, and dresses into our bags, take pictures with amazing views to be used later for slide shows, and get deliriously drunk afterwards. it was also my first time to go up mt. talamitam (full disclosure: i attempted it in 2006, but we instead found a campsite completely separate and different from the summit), which is close to mt. batulao. curiously, everyone else who climbed that mountain started after dark, which is a pity since the sunset looks amazing from there. the following month, i celebrated independence day by organizing a trip to south korea. there is no link between the two, but it was a good opportunity to experience some foreign trails. i've done two day hikes in seoul during my first two visits there and when i returned for a third time, it was my turn to guide my eager friends to the same peaks i've climbed. the hills around seoul are ideal for this sort of thing because they are very accessible, have wonderfully-maintained trails, and provide a fantastic contrast to the modern city that they surround like a natural wall. and besides, south koreans seem to agree with me that day hikes should be more appropriately regarded as low-intensity exercise. 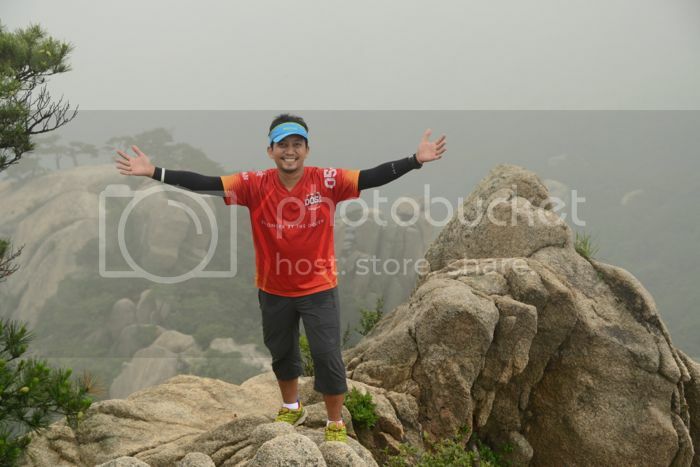 the object of our first day hike in seoul was to reach the jaunbong peak on the bukhansan national park. it is a massive granite outcropping north of seoul, which juts out like a stubby thumb from surrounding slopes filled with boulders, trees, and man-made trails. sections of the path that are either too steep or dangerous are reinforced by barriers, handholds, even staircases. always the highlight of any hike to seoul's mountains is that the trailheads are a mountaineer's disneyland, lined with outdoor shops and food stalls that lured climbers away from the trails. and since koreans consider day hikes as regular exercise, they descend upon these mountains in colorful droves. also part of the bukhansan national park is the baegundae peak, whose jump off is separate and different. there was a salomon trail run on the day we decided to start our trek and i personally found it odd that they hadn't started even at past 9 in the morning, although most of them were already done by the time we came back down. baegundae peak shares some similar features with that of jaunbong, but the experience becomes thrilling once you reach the granite dome that describes its peak, which is really just a large boulder inaccessible were it not for the metal steps and handrail that guide climbers all the way to a spot with a big rock and a flagpole. within shouting distance was another column of rock where we spotted rock climbers ascending slowly on its vertical walls. just below the highest point is a large, sloping platform that just vanishes at some point. the next day hike happened in july when robskie, a dutch intern from the office, asked about easy, accessible climbs. i presented a handwritten list of destinations, discussed the advantages of each, and was asked if i could take him to mt. batulao in nasugbu. i obliged, of course, not realizing that it is at this same mountain where i had one of my first day hikes after being inducted to AMCI. mt. 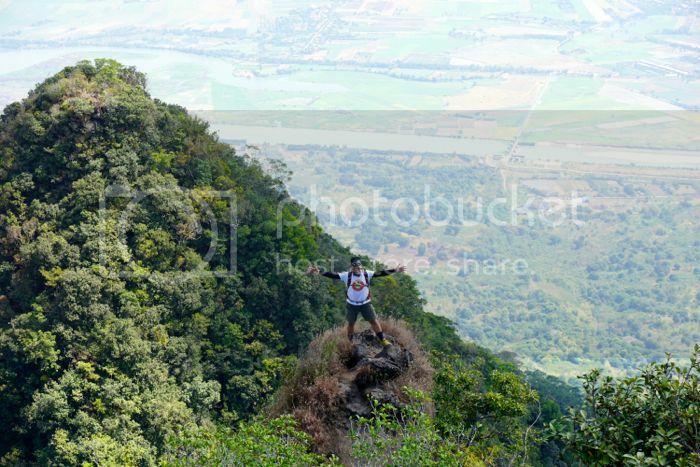 batulao is so close to manila that climbers spill into its slopes in overflowing buckets. i even met many of my friends along the trail, which shows that 1) i am very friendly; 2) my friends and i share similar passions; and 3) we are perfectly alright doing our thing without first having to announce it to the entire world. i don't think i've changed my mind about day hikes when i agreed to join a mt. 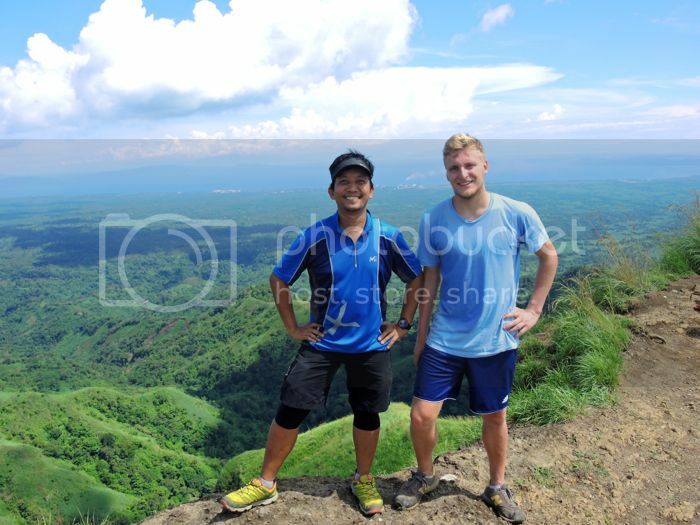 maculot trek as a way to grease the screws and bolts on mike's rusty mountaineer legs. mike has been living in kuala lumpur for over 2 years, and came back wanting to get back in shape on the trail, so i agreed to go, even when my body pleaded that i cancel it: i basically went straight to the bus station from a drinking binge. 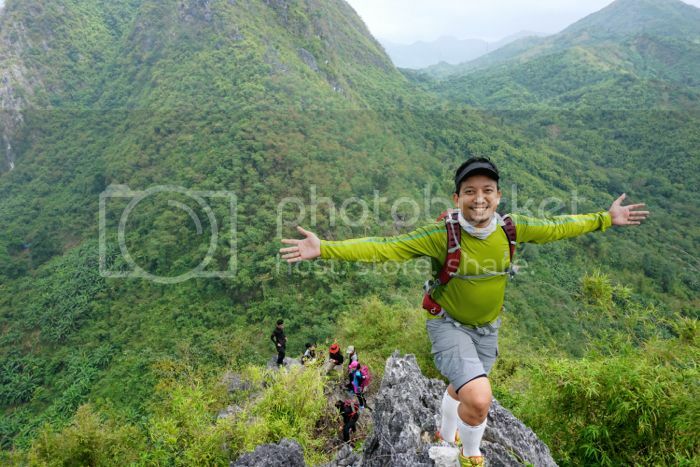 inspired to keep the safety of visitors following the incident that resulted in the death of a solo climber in holy week 2013, the barangay where the jump-off of mt. 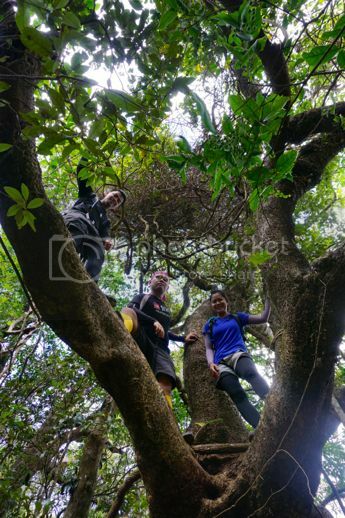 maculot is located has required climbers to be accompanied by guides, regardless whether they're staying overnight (the guide will just take you up), or if they're traversing to the grotto (the guide will just point to the general direction). 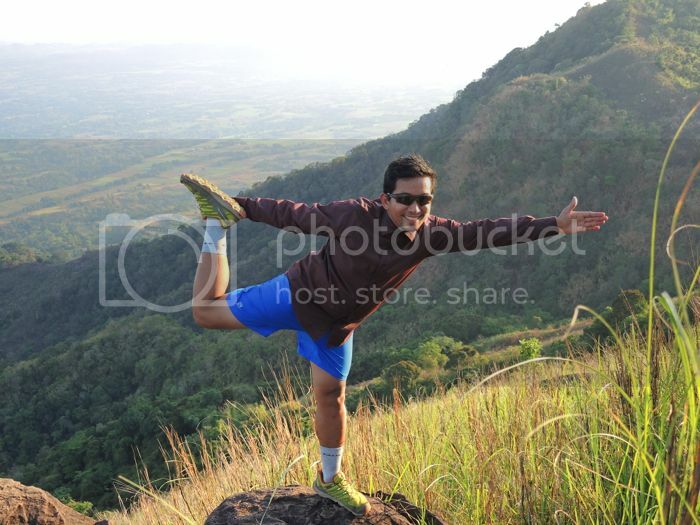 when i first climbed maculot in 2004, we decided to embark on what would be my first night trek. i liked that it was steep and challenging, and only the following day after waking up did i realize it wasn't worth returning to: the trail is dotted with makeshift stores selling overpriced mountain dews, buko juice, and halo-halo. and this explains why it took me 10 years to return, since it has deteriorated so badly i wouldn't want to go back there again (mt. batulao is a close second insofar as states of disrepair are concerned). 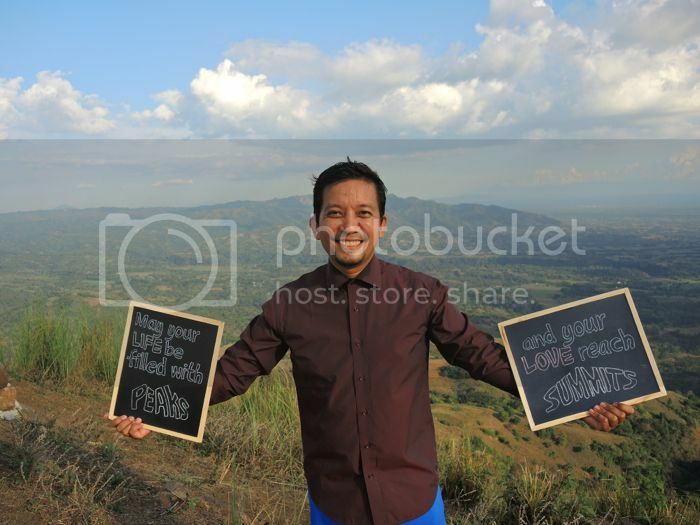 which is a pity really since maculot has excellent views of taal lake (not sea, as peachy mistakenly asked) and the surrounding plains of cavite and batangas. i didn't think i would rack up more day hikes so early in 2015 after the bakun-kibungan mountain ranges traverse and the mt. balingkilat-nagsasa cove traverse taking place in successive weekends, but how could i decline invites to do things for the first time? two weeks ago my friend marv, who has just recently developed a love for hiking (i bumped into him on the mt. 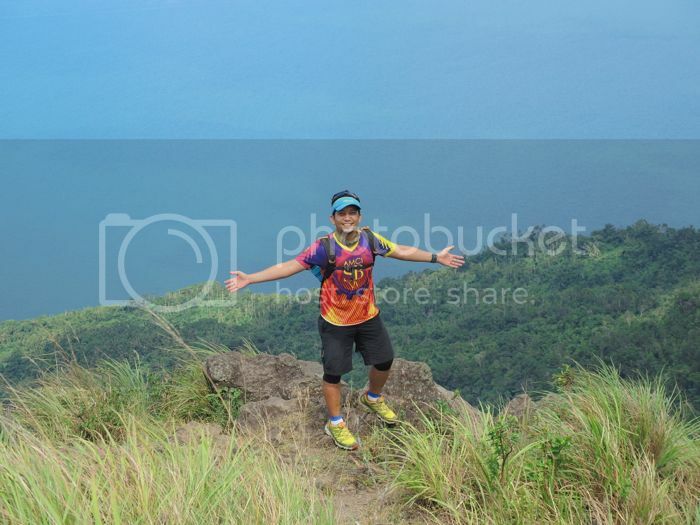 batulao trail in january last year, which would be his first of many day hikes already), organized a day climb to mt. pamitinan in wawa, montalban. he had given me the scantest of details, but i've never been there, and a new destination always excites me. i was also very pleasantly surprised to find out that it was very accessible: just an FX ride from cubao. the trail starts from the hanging bridge across of the tourist office of brgy. wawa, and goes up to the peak of mt. pamitinan, which is perched at a very modest 440MASL. but the trail close to the peak is very different from many of the mountains in my pocket. wawa is already a destination for rock climbers, and some of them were scaling the ulingan wall, and although getting to the peak of pamitinan will not require ropes or harnesses, much of the trail will have you scrambling over scattered boulders that have been shaped by millennia of rain into jagged outcroppings, lined with columns of sharp edges that could wound even the toughest soles. 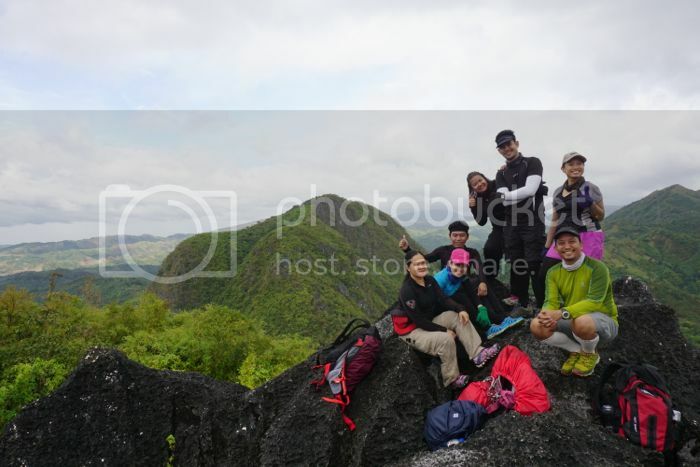 the summit itself is a small space on top of a pillar of rock with an unimpeded view of the marikina river and the surrounding landscape of san mateo, montalban, and the foothills of the sierra madre. i haven't done my research but wawa is actually a protected area, and has both natural and historical importance. it is actually a karst landscape, and underneath the peak is the pamitinan cave: a tunnel that burrows deep inside the mountain, possibly directly under the peak, and which is said to have been a secret lair used by katipuneros. the entrance is just above the river, an opening just 12 feet high and 15 feet across, although there are parts where a double-decker bus could fit comfortably. the cave path is marked by hoses that supply water to the barangay below, and suddenly becomes a maze that none but the most experienced guides can navigate. not that there are other tunnels, but some portions are so difficult that the guide has to hold on to your foot and place it into secret, unseen holds. when the guide told me we would have to pass through the spiral, i thought he exaggerated. but in fact, this cave exploration had me twisting, crawling, and stretching beyond what i thought was possible, through places where water has been writing lines on stone faces for centuries, and i left the experience with some new, profound pains. 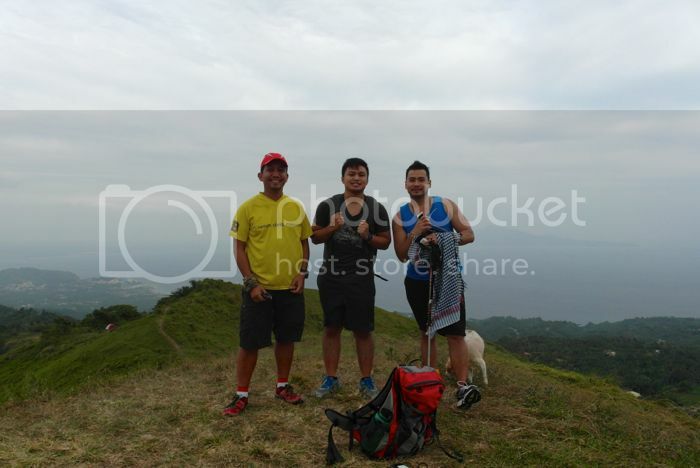 although the trails of pamitinan aren't well-maintained (actually, few places are, least of which those that are easily accessible), i wouldn't decline an offer to go back there since, as far as day climbs go, the twin peaks actually promise a good workout. and then last weekend i agreed to climb mt. arayat, the dominating feature on the skyline of pampanga, a volcano so imposing it can be seen from miles away, even while you're speeding on either the NLEx or SCTEx at an illegal 140KPH. i actually invited marv, but his response is classic of the kind of surprise i hear from people: that i had just been on a day hike. my response was: but we've had a week to rest. as pointed out by jason, one's credibility as a climber of mountains is eroded by the confession that one has not been to arayat. there were 10 of us in that group, and only 2 have been there previously. and yet here was a group of eager climbers with the itchiest pairs of feet i know (i climbed with troy, thet, and laiza on the first 2 weekends of january). very fast, itchy feet i must add, as we reached the south peak of mt. arayat in just over 3 hours starting from the park and despite plenty of rest along the steep trail marked at the beginning by missionary trails to oven beds baking charcoal. 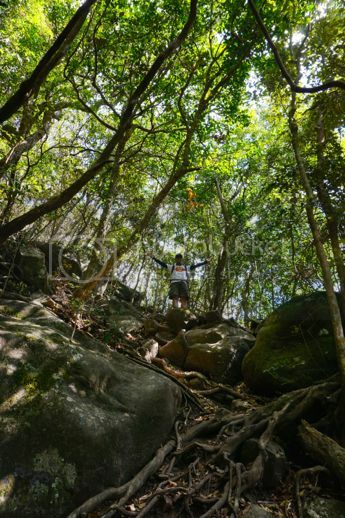 since it was my first time to be there, i was surprised to discover that the trail rises steeply over a trail strewn with boulders, where peaks are connected by narrow ridges, and that at some point over 300MASL, the canopy is so thick hardly any sun fell on our faces. we encountered people along the way, and on the campsite of the south peak was a group who had traversed from the north peak. there is a small view deck nearby: a spire of earth accessible by a shoulder only 5 feet wide in parts, and so small no more than 5 people can stand confidently on it at any given time. behind it are the vast plains of pampanga. there are many more peaks on mt. arayat, but they can wait another day. i spread my mediterranean lunch (ricotta cheese and honey and homemade hummus) on a groundsheet, and an hour later, we were returning to the park, picking up trash along the way. when i got down i told the park rangers to remind climbers about their duty as visitors to mountains: to keep it clean, and to keep it for generations of future mountaineers. i still haven't changed my mind about day hikes. that i have done 8 in the last year does not necessarily mean i have given it a promotion. too many of my friends know that i have declined many invitations for quick getaways somewhere far enough from the city to breathe fresh air, yet close enough that we are back in the places we so desperately wish to escape by bedtime. as in all these 8 day hikes, the intention should be very clear for me to participate in a mountain quickie: that i've never been there (or haven't been there in a while) and (it could also be or) something very special is taking place (such as accompanying virgins and returning mountaineers).